Cody’s appliances is factory-authorized service for Jenn-Air appliance repair. What that means for you is that our technicians are factory-trained, vetted, and background checked by the manufacturer to better represent their company and their products. For your safety and security, we ensure all Cody Appliance Repair technicians are competent, trustworthy, and qualified to handle your Jenn-Air appliance repair. We also undergo continual updated training on the Jenn-Air product lines and advances in the industry. The Jenn-Air Products Company was founded by Louis J. Jenn in Indianapolis, Indiana in 1947. The company was focused on manufacturing and marketing of industrial fans. In 1961, Jenn-Air’s integration of one of these fans to a cook-top range lead to the invention of the first self-ventilated downdraft range. 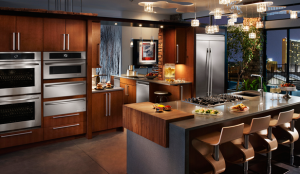 The company expanded its product line to include many other kitchen appliances including refrigerators, stoves and dishwashers. The Jenn-Air brand was acquired by Maytag Corporation in 1982 which was subsequently purchased by Whirlpool Corporation in 2006. The Jenn-Air brand is the gourmet product line for Whirlpool. If your Jenn-Air appliance needs repair in Boise, Eagle, Meridian, Nampa, Caldwell, Star, Middleton, Garden City, Emmett, Kuna, Garden City or Horse Shoe Bend, call us today at (208) 938-1066, or request service right here on our website! Let our family take care of your family. We are here to help.